Please note: this item CAN NOT be shipped to California, Massachusetts, California, Pennsylvania, and New Jersey. Our SAP gloves are a self defense weapon which helps to improve your punching power and also protects your wrist and forearm. Almost similar to the effectiveness of brass knuckles, these SAP gloves reinforce your fist with steel shot inside the knuckle area. They are an ordinary looking glove that you can wear casually in plain sight without causing suspicion, and can protect yourself if needed. 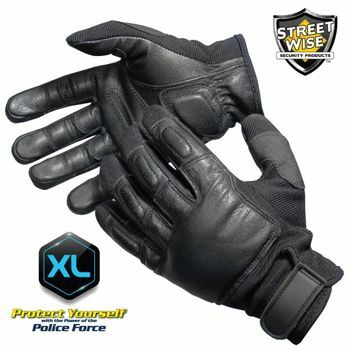 Also, great for wearing while on motorcyles to protect from road burn in case of an accident. Convent Size Chart: For your benefit there is a size chart on the back of the packaging. Large: 9 1/2"-10" XLarge: 10 1/2"-11"
7oz. of Steel Shot: This high quality pair of SAP Gloves have 7oz of steel shot strategically sewn into the knuckles to enhance punching power and protect your nuckles from impact. Velco Strap: Loop Wrist Closure with Velcro for secure fit. Design: The look and feel of ordinary gloves. Lifetime Warranty: The SAP Gloves are made of the highest quality components and comes with a lifetime warranty. See the enclosed instructions for complete details.